Bloomsbury USA Childrens, 9781681193779, 128pp. Addie is so excited to get a special visitor for the weekend, but things don't go quite as she's planned. Meanwhile, a new butterfly, Spring Shine, has come out of her chrysalis and somehow believes she's missing her magic-even though there's nothing wrong with her at all! It must be the magical curse at work, once again. When Spring Shine disappears, Addie must find her, and figure out a way to raise her spirits. Will she be able to help her friend, and discover who's responsible for this mess, before another butterfly gets hurt? Perfect for readers of Rainbow Magic and Princess Ponies, this magical chapter book series is a dream come true! 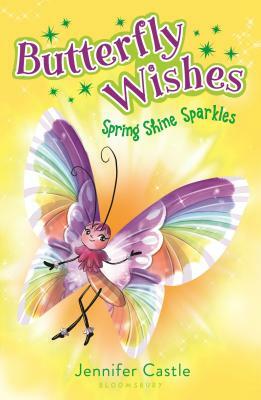 Jennifer Castle is the author of the Butterfly Wishes series and many other books for children and teens, including Famous Friends andTogether at Midnight. She lives in New York's Hudson Valley with her husband, two daughters, and two striped cats, at the edge of a deep wood that is most definitely filled with magic-she just hasn't found it yet.